Who are the football hooligan gangs of Britain? How did they form, who are their leaders and why do they fight? These questions and many more are answered in a unique and extensively researched two-part guide to a fascinating but little-understood subject. 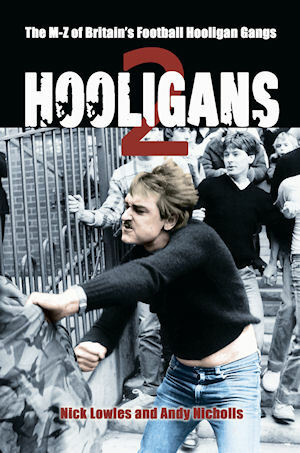 In an easy to read alphabetical format, HOOLIGANS Volume 2 covers all the major firms at every club from M to Z. Every football team in Britain has at one time or another attracted a hooligan element, from the Guv’nors of Manchester City and the Frontline of Middlesbrough to the Subway Army of Wolverhampton Wanderers and the legendary ICF of West Ham United. Now authors Nick Lowles and Andy Nicholls have interviewed scores of former and current gang members to compile the first ever encyclopedia of all the gangs. Each club has a separate entry listing the names of its gangs, their size, how they formed, their worst fights, bitterest rivals, and how police have attempted to infiltrate and apprehend them. Here for the first time are the histories of soccer ‘firms’ with names like the Naughty Forty, the Drunk and Disorderly Firm, the Bootboys, the 6.57 Crew, the Fine Young Casuals, the Lunatic Fringe, the CS Crew and the Goon Squad, all illustrated throughout with dozens of never-before-seen pictures. Nick Lowles is director of research at Searchlight, the international anti-fascist organisation, author of White Riot: The Violent Rise and Fall of Combat 18 and co-author of Mr Evil and White Noise.